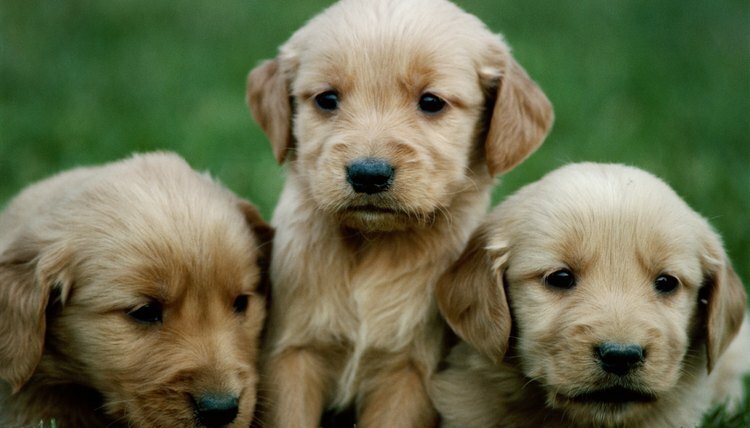 How Much to Feed a Golden Retriever Puppy? Feeding your golden retriever puppy the right amount of food keeps him happy and healthy. Avoid the temptation to load him up with treats or too much food as this breed is prone to packing on pounds, which creates health problems later in life. Moderation is key. Adhere to a rigid schedule in puppyhood and you will promote a balanced metabolism that sets the foundation for a healthy dog for the rest of his life. Puppies nurse from their mother until about six to seven weeks old. At three weeks of age, breeders introduce puppies to dry puppy food that’s moistened and made into a gruel for easier digestion. Ask the breeder which brand of food he is feeding the puppies and plan ahead. Purchase the same puppy food your breeder feeds to maintain a consistent diet when you bring your puppy home. Puppies should eat three times daily to support a balanced metabolism. Feed in the morning, midday and in the evening. The final feeding should be approximately 90 minutes before bedtime to allow a few potty breaks before everyone retires for the night. Schedule morning feedings after you’ve taken your puppy outside to eliminate and take him out within 10 minutes following breakfast. Arrange a midday meal about halfway between your puppy’s breakfast and dinner. Serve your puppy between 3/4 to 1 cup of dry food softened with warm water at each meal. Keep the food available for 20 minutes and remove it if your puppy hasn’t eaten it. Don’t be alarmed. Many puppies don’t have hearty appetites when they first arrive at a new home. Give it a few days. Your puppy should regain his interest in food within a day or two, once he settles in. Eliminate the midday meal when your puppy reaches between 12 and 20 weeks old. Rebelcreek breeders say if your puppy regularly shows a disinterest in a meal, usually the midday feeding, take the same amount of food you’ve been feeding daily, divide it into two portions and serve in the morning and at night. Maintain two meals a day to promote a healthy gastrointestinal tract, unless otherwise advised by your veterinarian. How Much Should You Feed a Lab Puppy?